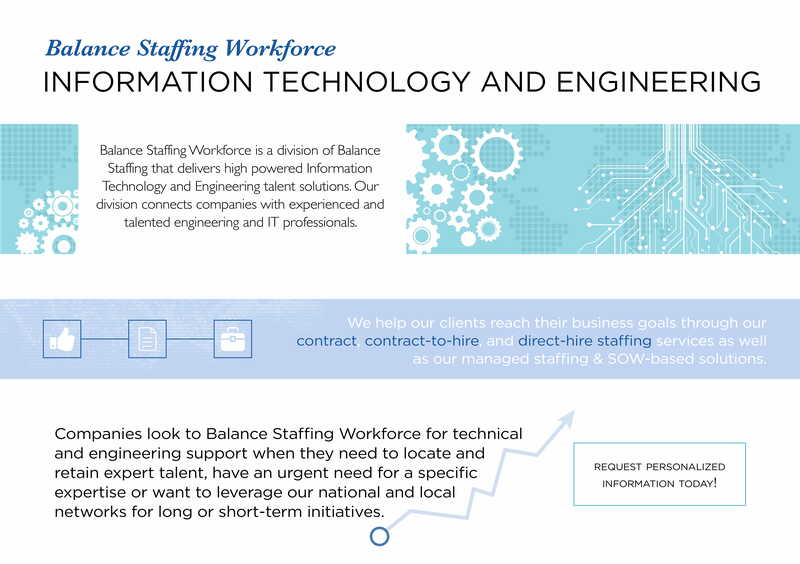 Balance Staffing Workforce is a division of Balance Staffing that delivers high powered Information Technology and Engineering talent solutions. Our division connects companies with experienced and talented engineering and IT professionals. We help our clients reach their business goals through our contract, contract-to-hire, and direct-hire staffing services as well as our managed staffing & SOW-based solutions. Companies look to Balance Staffing Workforce for technical and engineering support when they need to locate and retain expert talent, have an urgent need for a specific expertise or want to leverage our national and local networks for long or short-term initiatives.